Built in 1946, the cinema Salam in Agadir is one of the few buildings that survived the dramatic 1960 earthquake. Shot inside the cinema and in the surroundings of Agadir, the film is a poetic meditation accross local histories and temporalities. It questions the material logic of technologies such as the seismograph and the gramophone, privileging instead embodied forms of listening and knowing. Next to footages of the earthquake, the film excavates an account of the event by Soussi poet Ibn Ighil, reinterpreted by singer Ali Faiq. 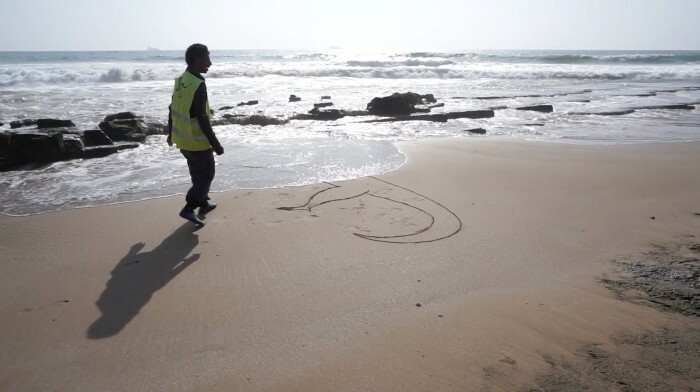 Survival anxieties also surface in the contemplation of dinosaur footprints on a beach nearby Agadir, echoing the movie « Godzilla » (Japan/US, 1954), which was screened inside the cinema on the night of the earthquake. Participants: Lahcen Aattar, Ali Bazegra, Samir Benteyane, Ali Faiq, Dounia Fikri, Abderrahim Nidalha, Jafri Yazza.